Throughout November Frymax held a spectacular competition with V.A.Whitley culminating in an exciting Prize Draw in December. Entry was gained every time customers bought more than 10 boxes of the RSPO Certified Palm Oil. CONGRATULATIONS TO ALL OF THE WINNERS. The facts about Palm Oil - and why stopping using it is not the answer! In recent times a lot has written about how bad Palm Oil is, but the truth is that a significant amount of work has been going on by Trade Organisations and Governments to assist farmers, growers, producers and processors to achieve a product which comes from a certified sustainable source. Most recently, Chester Zoo have come out in favour of the continued use of Palm Oil which is sustainable and not to switch to alternative vegetable oils as this would send the problem elsewhere and could have more serious environmental impacts due to more land being required. Tony's Talk - There isn’t a pea grown that can’t be cooked! Although the Nation enjoyed a fantastic summer, we all know that we are suffering the after effects. Lack of moisture and high temperatures have played havoc with the potato, wheat and pea crops. As previously mentioned, despite starting four weeks late our pea crop soon looked in great shape - well established with an abundance of flowers. Then at the critical time came the heat! Just as the flowers were to transform into pods temperatures hit 25ºC when flowers just fall off. Thereafter it really was a case of “spot the pea pod”! The NEW DRYWITE PRODUCT GUIDE is here! 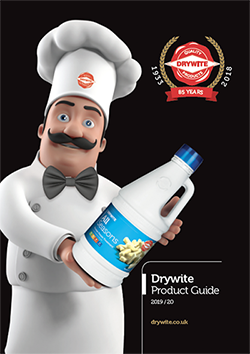 January sees the launch of the latest Drywite Product Guide - a handy addition to any shop! The glossy, smart design of the new catalogue really does showcase the great, innovative, quality products on offer from Drywite, available from us here at V.A.Whitley. 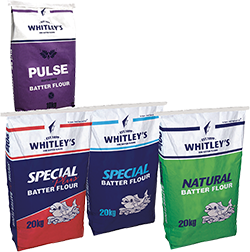 We have been manufacturing batter flours at V.A.Whitley for over 80 years, during which time we have built up a wealth of experience and understanding in the art of manufacturing our excellent range of Whitley’s Batter Flours. We have worked closely with Fish Friers and Suppliers alike to achieve our range of products that includes Whitley’s Special, Special Plus, Natural and Pulse (Gluten Free) brands, that have become renowned for their quality, taste and consistency. VA Whitley has teamed up with Frymax, the Country’s leading cooking oil, to reward lucky users with prizes worth thousands of pounds. 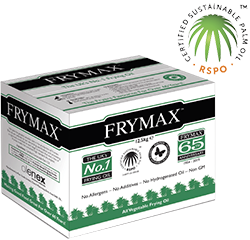 Throughout November, every purchase of 10 cases of Frymax from VA Whitley will gain a single automatic entry into a Prize Draw. The more you buy the more entries you can gain, but you must buy in quantities of 10. So, if you buy 20 cases you will gain two entries. The Winners will be drawn at random in December with spectacular prizes! Christmas is a great time for you to redeem your points as part of our Loyalty Scheme for you, our customers. 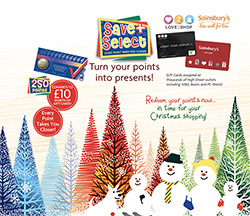 You can exchange just 250 Save & Select points for a great choice of £10.00 gift cards from Love2shop and Sainsbury’s. You can also exchange 1,250 points for a £50.00 VA Whitley Voucher. Redeem your points now in time for Christmas shopping! Tony's Talk - Time for something a little different? Fortunately, there are some undeniable truths about the food we eat. 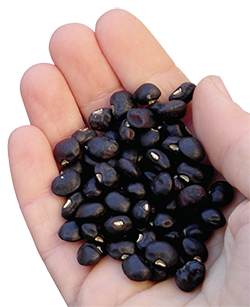 One is that Pulses are good for us being packed with protein, vitamins and fibre – and we should eat more of them. In the North particularly, we have recognised that ‘Mushy Peas’ not only enhance the appearance of a meal of Fish ‘n Chips but they also add to its claims to be a healthy meal. Like many people I believed that Marrowfat Peas were first introduced to Europe over 100 years ago from Japan. Known as ‘the plump pea’ or ‘the Fat Maro’ in Japan. 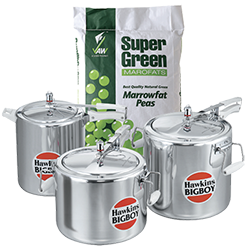 I thought that we somewhat perverse Brits must have renamed them ‘Marrowfats’! 2019 Calendar on its way! A favourite with our customers, our customer calendar, is set to make its way to you very soon! 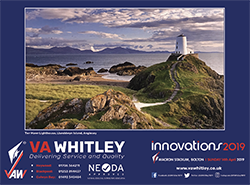 Due to be sent out with orders during December, our 2019 calendar features a stunning image of the Twr Mawr Lighthouse at Llanddwyn Island, Anglesey. A beautiful, picturesque part of the country. It’s time to get Mushy once again and celebrate the much-loved accompaniment to the Great British Fish & Chip supper…International Mushy Pea Day is back! On Friday 9th November, the Mushy Pea party begins with the spotlight turning to the best side dish in the world. 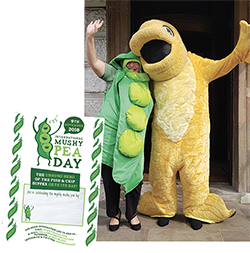 International Mushy Pea Day isn’t only a day to shout about the side and spoil pea fans, it’s also a day in which you can try promotions within your shop, experiment with new reci-peas and gain national exposure through the resources available!